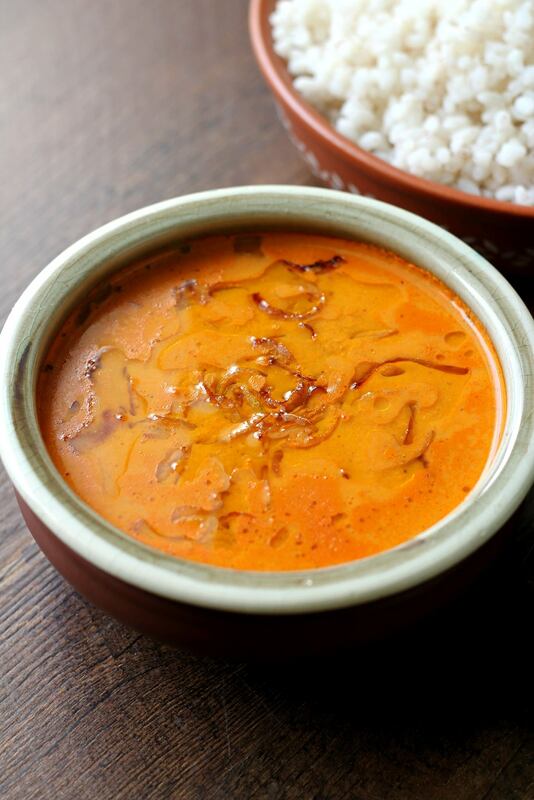 ‘Sheeth ani saar’ ~ three words that spell comfort food. 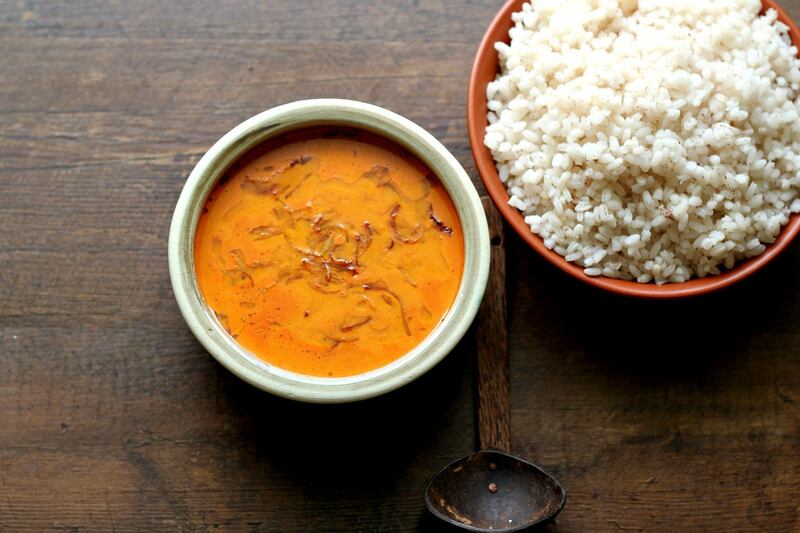 In Konkani ‘sheeth’ stands for cooked rice and ‘saar’ stands for gravy. 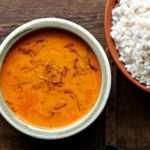 While the term is synonymous with a basic vegetable curry in most languages spoken in Mangalore, the term ‘meen-saaru’ stands for fish curry in Kannada/Tulu. Today’s recipe is for ‘sorak’ a lesser used term for the saar that we Mangaloreans love. This recipe is for a basic coconut based sorak while in the past I have shared the recipe of a watery, rasam like sorak that does not use coconut. 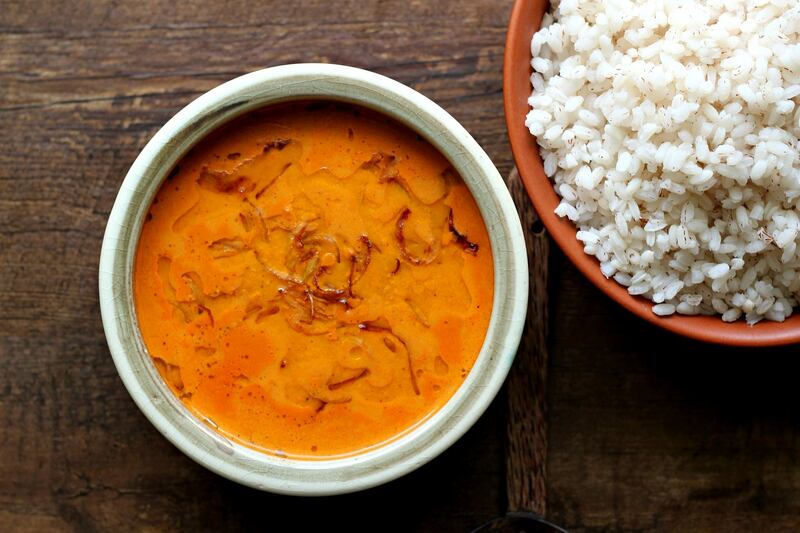 The coconut-y one is delicious when eaten with red boiled rice, a variety of rice that is popular in South India. I am lucky that despite the fact that I am living in a foreign land, Lulu, the supermarket is the god of all things South Indian. We get most of the ingredients required for our Mangalorean cooking from there and so I don’t really miss out a lot on our traditional food. All it takes is one trip to the store to be able to rustle up a fond food memory in a couple of hours. Coming back to the topic that I started in my previous post, the resolution I made last year was to learn new things. Like most people, I am terrible at making and keeping specific resolutions like ‘lose 10 kgs in 2 months’ or ‘wake up early and go for a walk’. I decided to keep it simple and learn new things. I did, in fact, focus on that one thing that led me to achieve quite a few things in 2017. Learning new things meant that I had to break out of my comfort zone and test waters. None of this was fun or came easy. For example, despite having driven on the difficult, traffic ridden roads of Mumbai & Mangalore, I was shell-shocked to drive on the roads of Dubai when I got my driver’s license last year. It required a lot of motivation and pushing myself out of my comfort zone to be able to drive on a regular basis. Besides this I also did what I had been putting off for years – this new website, which has been my dream since long became a reality when I actually decided to break out of the monotony and redesign it (conceptualise it), contact someone who would execute the job, visualize a logo that would capture the essence and sentiment behind my work and put that to paper. In the bargain, I learnt to do so many new things on my own. Last but not the least among the most significant learnings of last year was to finally start my own YouTube channel. Shooting food videos was a dream I nurtured since 2011 and it finally became a reality in 2017 when I let go of my fears and took the plunge. To be the jack of all trades was not easy at all. From setting up the scene and equipment to writing down the flow of the video, sourcing ingredients, prepping, cooking and plating the food, it is a job that takes twice or thrice as much time as it normally would, to make the same dish if you have the additional task of making a video out of it. But what inspires me is the fact that we all have very limited time and tomorrow is another day that will take up our time in a myriad different ways and so if something needs to be done today, just do it and be done with it. So far I have received a lot of love and positivity from you, my dear readers and I wish and pray that this continues in the years to come. I hope to be able to bring you many more delicious Mangalorean and other contemporary recipes to delight your tastebuds. I now leave you to savour this beautiful coconut sorak that you can enjoy with some piping hot curry with any veg or non veg dryish side dish of your choice. Bon appétit! Grind the spices (dry chillies, mustard seeds, peppercorns, cumin seeds) to a fine powder. Then add the coconut, onion, garlic & tamarind and grind to a fine paste using approx 3-4 tablespoons of water. To season, heat the ghee or coconut in a seasoning pan, add the sliced onions and fry them till light golden. Thanks Rafee! You should take the plunge and start videos! Lemme know if you need any help at all! Looks Yummy Shireen! and looks quite easy to make as a quick accompaniment for the dry items! Thanks Sandy! Hope you get to prepare it soon! Hi, such an easy recipe although I have no clue what to expect in terms of flavour coming from north India. But I just want to try some veg spicy curry front eh south. I wanted to ask if I can omit the tamarind since I have been prescribed to avoid citrus also can I use coconut milk instead of grated coconut?